The ritual starts at 9 am every Wednesday. The 18,000 sq ft building on the bustling National Highway 2 in Uttar Pradesh (UP) is packed with a boisterous bunch of young ardent ‘devotees’ from the adjoining village of Maholi. The crowd, which includes over a dozen turbaned middle-aged men in their early 40s, has come for a glimpse of the main ‘deities’ enshrined at Aryaman Enterprises, around 2 km from the temple city of Mathura. The chatter ebbs suddenly as Krishna Singh enters the sprawling edifice. The bulky ‘priest’, dressed in brown leather jacket with armour pockets on its shoulders, greets the crowd as he walks down towards the sanctum sanctorum, where an aesthetically designed Classic 350 is displayed on a wooden platform. Singh, 28, lowers his Ray-Ban glasses and glances at his Apple Watch. At 9 am, he presses the electric start button, and revs up to full throttle with a slight twist of the right wrist. “Rotating the wrist towards oneself increases the amount of gas that feeds the engine,” he informs the pack, atop a fleet of Bullets and Thunderbirds, who duly repeat the ritual. Aryaman Enterprises, the only Royal Enfield (RE) showroom in Mathura, reverberates with a loud thumping sound. The crowd lustily cheers the show that Singh conducts every week to build excitement and connect with potential buyers. A few students from Maholi, enrolled in Agra’s Dr Bhimrao Ambedkar University, inquire about the price of the recently launched Twins—Continental GT 650 and Interceptor 650. Others are curious to know about the delivery time for a new Classic 350. A troop of agents from top banks and NBFCs—HDFC, Tata Capital, Cholamandalam Finance and Hinduja Leyland—starts hunting for prospective buyers, wooing them with tantalising loan deals. Some even go to the extent of offering 100 percent finance on the on-road cost. “This showroom is a temple for us,” beams Singh, who opened it in 2015. At that time, just 6-7 percent of all bikes bought were on finance. Today, about 60 percent are bought on monthly instalment schemes at Aryaman and another outlet at Kosi Kalan, roughly 45 km from Mathura, that Singh had flagged off a couple of years ago. “RE bikes have a cult following in UP,” he contends. Twice every month, Singh conducts rides for owners of RE from Mathura and Agra. There has been, he lets on, a steady year-on-year (y-o-y)sales growth since last November. From 25 bikes per month during early 2015, the numbers leapfrogged to 170 units this March. No wonder, UP has become the second biggest market for RE in volumes. UP is a silver lining for RE at a time when the maker of the iconic Bullet and Classic has had its dream run of a decade rudely interrupted in the past five months. 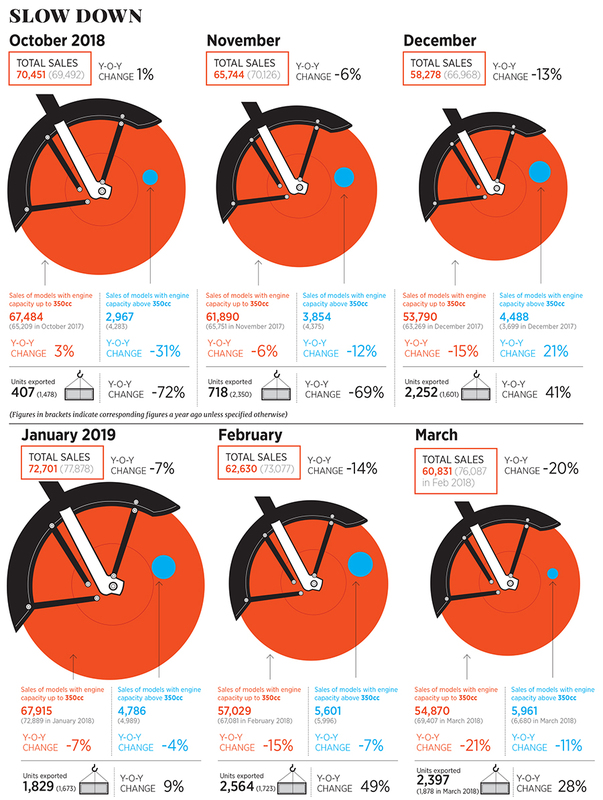 From a 6 percent dip last November over a year ago, after a muted growth of 1 percent in the preceding month, sales tumbled to 13 percent in December. The New Year started with a fall of 7 percent, followed by a plunge of 14 percent and 20 percent in February and March, respectively. Kerala, the biggest state for RE, has been logging abysmally poor numbers on the back of the floods that hit the state last year. Equally alarming is the slide in the traditionally strong states with high per capita income: Maharashtra, Karnataka and Tamil Nadu. Contributing to the de-growth is product fatigue: Classic 350, RE’s highest-selling model, has not had any major upgrade or variant since its launch in 2010. 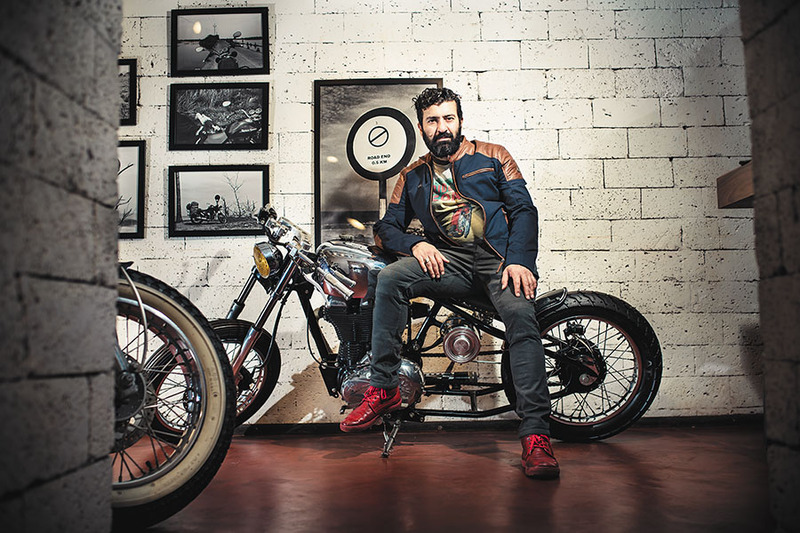 Siddhartha Lal, managing director at Eicher Motors, which makes RE motorcycles, is in no mood to press the panic button. “It’s not normal, but equally not alarming,” he says, adding that RE has not had negative growth in a decade. Over the last decade, it had an excellent run of growth of nearly 20x and margins ranged from 10 percent to 30 percent at the Ebitda level. “Still I won’t read too much into it. The fundamentals are intact. It won’t be long-term negative growth. The RE story is about premiumisation and it’s strongly in place,” says Lal. In early April, Lal announced a fundamental shift in how Eicher Motors will be run. 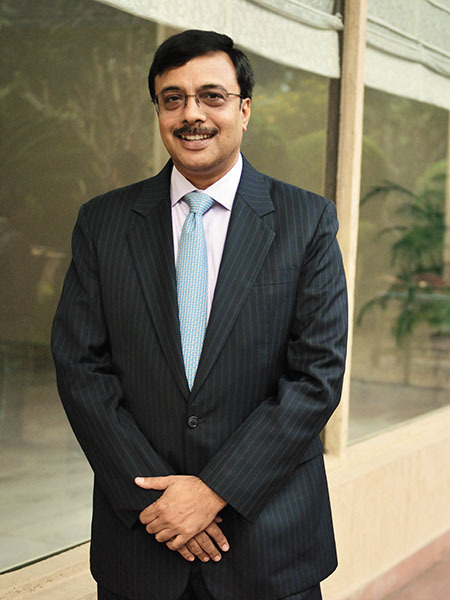 Newly anointed CEO Vinod Dasari will be at the helm of the day-to-day running of RE’s domestic operation, with the London-based Lal freeing up mind space to execute a bigger-picture play that includes a larger global presence. “To achieve our audacious goal of 2030, to catalyse and reshape the world of motorcycling towards middle-weights (350-750cc), thereby growing at twice the pace of the industry, we need to run the company differently,” Lal wrote to his employees. 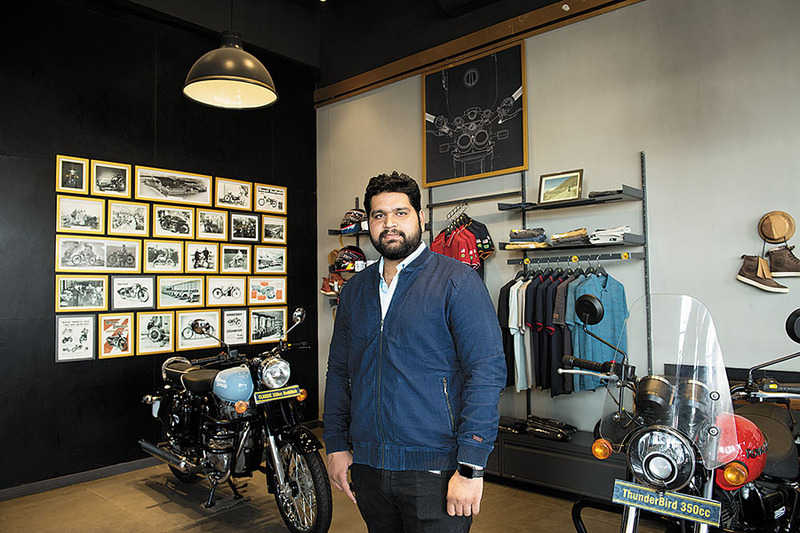 “I believe I can serve RE better by playing a role that is different from the CEO.” Dasari, who is based out of Chennai and also gets a board berth on Eicher Motors as executive director, is the man Lal is counting on to take RE “into its next phase of evolution to a global brand”. Lal’s optimism stems from the fairy-tale success that RE has scripted over the last decade—from virtually nothing to an over 90 percent share in the segment above 250cc. The success, he avers, has been due to a combination of reasons. RE’s rebound started from 2010 onwards with the launch of the Classic 350, which still makes for over 70 percent of units sold. A series of key steps contributed to achieving that cult status. A radical top-down marketing approach was one of them. Lal decided to make the seven top cities—Delhi, Mumbai, Bengaluru, Chennai, Kolkata, Pune and Hyderabad—catchment areas for consumers visiting from smaller markets. “Punjab and Kerala were already doing well for us,” Lal recalls. The idea was to reach out to smaller towns through these seven top cities by revamping stores, educating handpicked dealers and ensuring a ‘wow’ experience for visitors. If a guy from Kolhapur, Lal explains, comes to Mumbai or Pune and visits the store, he should go back with the feeling of yearning to buy the motorcycle. “It was a trickledown effect,” he says. Along with new-look stores, RE began organising rides and hosting events for its users, which helped it ‘pull’ users towards the brand. A pull strategy, Lal stresses, takes much more time than a push strategy. A pull strategy was ably supported by an aggressive ramp-up of dealers across India. From 198 in December 2011 to 878 seven years later, RE meticulously expanded its distribution reach across the country. Of late RE has been casting its net wide in smaller towns. Underlining the speedy uptick was the critical role of financing. “It brought an aspirational brand, which was priced premium, closer to the masses,” reckons Saurabh Jindal, analyst at Bonanza Portfolio. The RE story, he contends, played out strongly largely because of readily-available finance, which had a lot to do with the high resale value of the motorcycle. Another trend, which originated around 2011 but gathered steam over the next few years, was the SUVisation of RE bikes. What started as a utility vehicle (UV) meant for off-roading and hauling morphed into a sports UV and found wider acceptance among users. SUVs started getting used for daily commuting. RE’s success in the mainstream, contends Lal, is similar to the SUV’s success. What also happened alongside was premiumisation, with commuters upgrading to above 350cc segment, where price tags were ₹1.65 lakh upwards. Back in 2011, Lal recounts, the first set of commuters were those who were upgrading from 150, 180 or 200cc. Four years ago, the second stage of upgrade started. Many 100cc users started buying RE. Today, Lal points out, the percentage of people coming from 100cc to RE is a tad higher than the ones coming from 150cc plus. The third stage of upgrade happened recently: Youngsters buying RE as their first motorcycle. Around one-sixth of RE customers are now first-time motorcycle buyers. Club this trend with the faster pace of migration from the commuter segment (100-180cc) to premium (above 250cc). “Over the next decade, the premium segment will grow quicker than the commuter segment,” Lal predicts. For the time being, though, what is acting as a spanner in RE’s scheme of things is a general two-wheeler slowdown in India. Hero MotoCorp (20 percent y-o- y dip) and Honda Motorcycle (47 percent y-o-y fall) posted their highest declines in monthly sales in March FY19. From a robust 15 percent growth in 2017-18, the industry is down to under 7 percent in 2018-19. 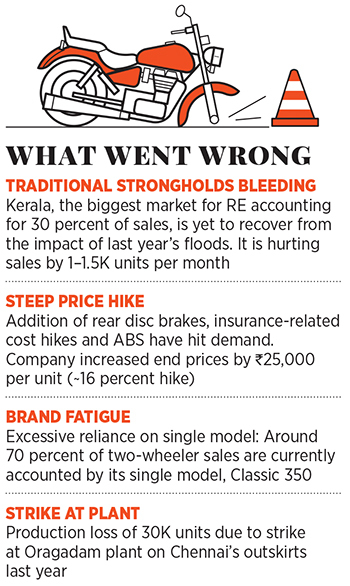 A steep price hike by RE of ₹25,000 per unit—on the back of addition of rear disc brakes, mandatory insurance-related cost and ABS—has hit the demand. Despite sliding sales, auto experts point to the silver lining. “The good news is that RE doesn’t have to do anything drastic to stem the tide,” reckon Amit Kaushik, managing director at Urban Science, a Detroit-based global consulting firm. “Resurgence in markets like UP gives it some elbow room.” The latest announcement about the planned capital expenditure of ₹700 crore for FY19-20, and the move to appoint Dasari as CEO are steps in the right direction, he adds. “Lal’s new role is what he always loved to do: Product innovation and strategy,” says a senior Eicher Motors official. “It’s Eicher Motors 2.0 and Lal would again be shaping its global success.” Having a new CEO, he lets on, does two things. First, Eicher Motors now has a local custodian whose main job is to maintain the growth, if not accelerate it. “Shedding operational role gives Lal enough bandwidth to go global,” he reckons. As of March 2018, Eicher Motors had ₹2,482 crore of operating cash flow on its books, ready to be ploughed into the business. Debt stood at ₹151 crore. The bad news, though, is that RE’s dream run with high sales is now a thing of the past. “It can’t gallop now, and the growth will be steady,” Kaushik maintains. There is another danger lurking: RE could go the Bajaj Auto way. Kaushik explains: Bajaj lost its focus on the domestic market in its quest to become the biggest two-wheeler exporter and a global player. RE, Kaushik points out, too has expressed global aspirations. A falling domestic market but a rising export over the last five months due to the launch of Twins might tempt the management to get biased towards exports. “Any loss of focus from the domestic market could spell trouble for RE,” he cautions. The looming threat from rival motorcycle brand, Jawa, too might add to the woes. Lal, for his part, is aware of the significance of the home market. “Without India, we cannot do anything,” he avers. India is where the scale comes from. The global aspirations, he points out, will happen on the back of a strong foundation back home. “We are well-poised to become the first global consumer brand, or premium consumer brand, out of India,” he says. But can the global dream survive with a sliding domestic market? Lal touts the virtue of staying patient. If you are an investor, he lets on, and only care about quarterly numbers, then please sell your shares and give it to somebody who believes in a long-term approach. “I am not greedy for the short-term. This (short-term thinking) circuit is not there in my brain,” he says.